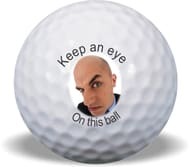 What better way to promote your business than with logo golf balls or personalized golf balls. Imagine having your company name, slogan or logo on Titleist Pro V1 balls!" If you want to ensure your company stands out during special events, marketing campaigns and trade shows, or at a golf tournament, nothing does it better than custom golf balls with your company logo. PromoGolfBall is a leading-edge precision pad printer specializing in colour spot and process golf ball printing. 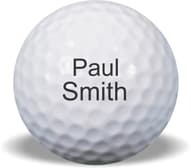 We can personalize or print your logo on major brand names such as Titleist, Nike, Bridgestone, Callaway, TopFlite, TaylorMade, Dunlop, TaylorMade or on blank balls... Order now and your personalized golf balls will be ready in 5 days. You don't have to order large quantities. The minimum order is only 1 dozen. They are great birthday or Christmas gift ideas! 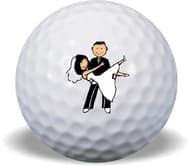 You can also give wedding golf balls as golf wedding favors, with a wedding logo on one side and the bride's name, groom's name and date on the other side. Monogrammed golf balls are excellent promotional items. We ship anywhere in USA and Canada. We offer a wide selection. Whether you are looking for soft feel, firm feel, low spin, high spin, different dimples or different covers (surlyn, urathan, ionomer or fusablent covers), we have them. We have golf balls for players with high handicaps or low handicaps as well as balls used by the professionnals on the PGA tour. We don't sell refurbished or used golf balls but we do have cheap golf balls for high handicap golfers. Every year or two, manufacturers keep their products relevant and fresh. They add new models or tweak their products to enhance performance.